Mark Lawrence has found great commercial and critical success with his Broken Empire series of books which mixes elements of science fiction with a heavy dose of fantasy. For readers hankering after more stories from that world Lawrence has published a book of short stories. 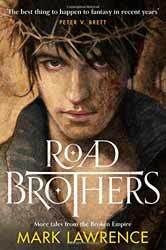 Road Brothers: More Tales from the Broken Empire (2017. 276 pages) explores the past of some of the most memorable characters as well as some of the secondary one. As well as the fourteen tales the book also contains a map and an introduction by the author. I have previously reviewed his longer novels and have been very positive about these, the shorter form of the short story is much more difficult to master as they must be lean, due to the restricted word count, but also feel complete as a story. Its good to see that Lawrence is just as adept at this form as he is at writing door stop novels. The contents of the stories represent the central figures well, so Jorg is in many the stories, fleshing out his past, likewise Makin, Red Kent and the Nuban have their own tales. Lessor characters are also well represented. The full list of stories is A Rescue, Sleeping Beauty, Bad Seed, The Nature of the Beast, The Weight of Command, Select Mode, Mercy, A Good Name, Choices, No Other Troy, The Secret, Escape, Know Thyself, Three is the Charm. Each of the stories comes with a footnote which illuminates either some of the themes of the larger work or is an explanation as to why the author thought the lessor character deserved their day in the sun. Overall this is a pleasant adjunct to the main cycle and while some of the stories have appeared elsewhere there is enough original material to warrant buying it.